Whatever kind of business you're running, the most important thing you need in order to improve it is customer feedback. No matter how much money and effort you put into it, you'll never make it a success unless you know what customers want - and sometimes that can be less obvious than you might think. Identifying the needs of the local customer is essential to developing a successful business enterprise - so how can you go about it? The simplest way to get customer feedback is to ask for it, but if you're going to get honest answers, your customers will need to feel comfortable about talking to you. Sometimes business people seem too aloof and professional for the customer to feel confident, and seem to know their business so well that customer suggestions would be pointless or unwelcome. If you want customers to talk to you, it's important to create a relaxed, friendly atmosphere. You should also make sure that your staff seem approachable. Try putting up a sign which says that staff are there to help and are happy to deal with any problems the customer may have. It helps if your staff use the kind of products or services you're selling themselves, so that they can give more helpful, personalised advice and can understand and react usefully to customers' more trade-specific suggestions. 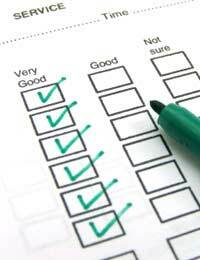 Supplying a simple feedback questionnaire along with your products and services should be standard procedure. Make sure it has a box for writing in suggestions, not just questions soliciting yes/no answers. If this doesn't work well with your type of business, try a suggestions box instead, with notepaper and pens available for making contributions to it. You can encourage customers to use it by entering them into a prize draw when they do so or by giving them small free gifts - but make sure they don't have to attach their personal details to their suggestion, as this may discourage them from making complaints. A more in depth strategy for finding out about customer opinions is running focus groups. This involves inviting local customers to a meeting, with a reward (such as vouchers for your business) available for participation. A focus group gives you the opportunity to discuss what you're doing with your business, and what you could do better, within a customer-led framework. Ask participants to think about how you might make useful changes before they arrive, then encourage them to speak up. In this context, you'll be able to get a feel for just how much support particular ideas have, and you'll have some warning if a suggestion made by one customer might have negative consequences for others. Often customers hesitate to provide feedback to businesses because they don't believe that anyone pays attention to it anyway - they think you only ask for it to flatter them that their opinions matter. Letting them know that you really are listening can make a world of difference to their willingness to contribute, and can also increase their loyalty. This can be simple to do. For instance, you can start a questionnaire by commenting on what customers have said to you previously and the changes you have made as a result. Or you can ask directly for feedback on a recent improvement which you've made in response to customer suggestions. Getting accurate customer feedback can really give your business enterprise the edge, enabling you to invest wisely in those things which are going to make the most positive difference. What's more, customers will be much happier about doing business with you when they can see that you care what they think.